Firefly Morse Code: "I'm Your Love Bug!" Guess Who's Coming for Dinner? You Are! Got A Bad Taste in Your Mouth? Chemical Action, What's Your Reaction? I Can Fly, But I'm Not a Fly! Current Happenings: Beautiful Birds and Babies, Too! One of the most enchanting sights of the season is the delicate light of Fireflies blinking in the night. Found on every continent around the world except Antarctica, these graceful little stars put on a magical show each year that would make even Tinkerbell jealous! What's really going on in the dark? If you've been lucky enough to see them, you'll know that fireflies or lightning bugs can be seen in meadows, near marshes, fields and backyards in the eastern U.S. and parts of Canada. Unlike some other insects, fireflies are no bother to us humans. They don't sting, bite, attack or carry disease. But what's really going on out there in the dark? What do all the blinking lights mean? And how do fireflies generate the light we see? There's so much more to learn and admire about fireflies than just a mini-Fourth of July light show. Read on--you'll be amazed! There are over 2,000 species of fireflies in the world and approximately 200 species in North America. Some species of firefly actually don't flash. But among flashing fireflies, each separate flashing species has its own unique, distinguishing flash pattern or signal. But just who's doing the flashing? Who's watching? What are they watching for? And what do the flashes mean? Well, one purpose of the flashing is thought to be a signal system for attracting mates--a sort of Firefly Morse code for "Hey, baby! I'm the light of your life, check me out, let me be your Luvvv Bug!" "Males and females find each other by exchanging light flashes called bioluminesence, or by emitting chemicals called pheromones. In flashing species, males cruise and flash at or above the tree line at the edge of meadows. Females usually sit on bushes and other low plants, and wait for the right male before flashing a return signal." The firefly's light source is not located where you might think. In fact , the light source on these tiny lanterns is located on their behind or posterior--close to the tip of their abdomen. Poet Ogden Nash seemed to have noticed this when he wrote this limerick . "If you were a FEMALE firefly, what type of a male flash pattern would be more attractive to you? Do you think there would be some strategy in a male's flash? What information might the flash rate tell you about the male? Think about what information you might want to know about the male." "If you were a MALE firefly, what kind of night conditions would you want so that female fireflies would be sure to notice your flashes? What conditions, both natural and man-made, could enhance or impair a female's ability to see your signals?" 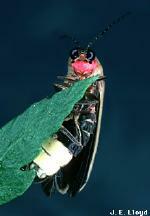 How do you think Marc Branham's theories about male firefly flashes first developed in his mind? Marc tells us how he came to think about this question, and how he thought through the testing and experiments he conducted to explore his theories. Fireflies seem to have such a peaceful way of communicating with each other. The male blinks his half of the code and the female answers with her half of the code, and hopefully they find each other and mate. But, sometimes things aren't what they seem. While scientists believe that the firefly's luminous abilities are a system for attracting mates, some believe that it can also be a protective system for warning off predators. Scientists from Purdue University believe that the firefly's light tells "birds and other insects that fireflies aren't a good tasting meal. Like the orange color on a monarch butterfly, or the yellow stripes on a wasp, the light end of a firefly lets predators know to avoid eating them." Marc Branham reports that although the amount varies from one firefly species to another, "as far as we know, all fireflies seem to be chemically protected by defensive chemicals called 'lucibufagins' that are noxious and sometimes toxic to organisms that try to eat fireflies." Lucibufagins in fireflies were discovered by Dr. Thomas Eisner of Cornell University. However, certain species of fireflies are known to have very low levels of this chemical. And here's where "aggressive mimicry" comes into play. Marc notes that females of the species with low lucibufagin levels are able to gain more of the chemical protection--which they can transfer to their eggs--by attracting and eating other species which have higher amounts of the defensive chemical. "Some frogs have eaten so many lightning bugs that their stomachs shine as though they swallowed a light bulb." Have you ever wondered just what it is that produces the light on a firefly? You're not alone. This same question led scientists to study this over one hundred years ago, and the results of that research continue to help us even now. Would you believe that research about fireflies' bioluminescent glow has played a role in many "glow in the dark" products like toys that you play with? Read More: Link to some "Illuminating" thoughts on this topic! Did you know that the name firefly is a misnomer? With common names including firefly, lightning bug and glowworm, fireflies are actually small, soft-bodied beetles, and not flies at all! They are in the family Lampyridae (pronounced lamb-PIER-ri-dee), which comes from the Greek root "pyr" meaning "fire" or "shining fire". "A firefly can fly, so why isn't it considered a fly? How can you tell the difference between a fly and a beetle? Can you name a characteristic(s) that distinguishes them apart?" Firefly larvae, sometimes referred to as glowworms, are six legged, flattened worm-like creatures. They can live up to two years and live underground, and sometimes in trees and underwater (breathing through gills...Really!). They munch mainly on snails, slugs and earthworms. In contrast, the adult life of these code-blinking beetles is very short--many species live only about two weeks as adults. Achieve at times a very star-like start. Only, of course, they can't sustain the part. What state in the U.S. has more firefly species than any other? What city has a firefly festival every year, and has been designated the firefly capitol of the U.S.? What continent has no fireflies at all? Which U.S. STATE/city has named the firefly its state insect? Fireflies are on the decline. Pesticide use and habitat loss are the major causes, i.e. mowing of fields, destruction of marshes, wetlands bogs and woods. To help attract fireflies to your yard and support the firefly population there are several simple things that you can do to help. Take a look! Invite students to use the facts they've learned about Fireflies to write poems or limericks, like Robert Frost or Ogden Nash did. Helen O'Harra reported on May 13 that Violet-green Swallows have returned to Chester Creek Greenbelt in Anchorage. Rose-breasted Grosbeaks, Ruby-throated Hummingbirds, Baltimore Orioles, and a host of warblers are reaching the northern states and provinces now, to the delight of many. Seven or eight White-crowned Sparrows turned up at the feeder of Elise Caswell in Bethel, Maine, on May 12. Lucky people who feed birds may see Rose-breasted Grosbeaks at sunflower feeders, or White-crowned Sparrows, usually feeding on the ground, at sunflower or white millet. Another sign that spring is progressing is the number of nesting birds. People are seeing cardinals, jays, crows, and other birds nesting now. In northern Tennessee, Gerry Stewart got a new digital camera right when her backyard bluebird eggs were hatching. She sent us a whole gallery of baby pictures! This is our final Signs of Spring Update for Spring, 2003. But that doesn't mean people will stop clicking on the owl button to report other signs of spring. If you see anything new or unusual, let us know so others can learn about the riches of the season. Last time we asked you to "Use the Internet and information from your state or province’s agencies to find out if your state or province has laws requiring people to use non-lead sinkers and other fishing tackle. If not, make a list of ways you and your class could help get a law passed to protect loons from lead tackle. Then write your government officials to tell them!" Writing letters to your state legislator really can make a difference. In some states, organizations are providing "trade-ins," allowing people who fish to bring in their lead sinkers and other tackle, to trade for non-lead tackle. Then the lead ones can be properly disposed of so it won't end up in the water, hurting loons and other animals.Kids helping their local bird clubs with projects like this can make a real difference! Year-End Evaluation: Please Share Your Thoughts! Please take a few minutes to share your suggestions and comments in our Year-End Evaluation Form below. The information you provide at the end of each year is the single most important tool used to guide our planning. This is the FINAL Signs of Spring Update. Have a Great Summer! Copyright 2003 Journey North. All Rights Reserved.